1. Preheat the oven to 190°C/375° F/Gas Mark 5 . 2. 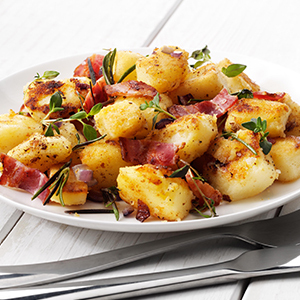 Drizzle the McCain Chef Solutions Simply Potato Dice with olive oil and place in the steamer for 20 minutes, then leave to cool. 3. Grill the bacon until crispy, approx. 10 mins. 4. Finely chop 400g of onion and pan fry adding sugar to caramelize. 5. Put the cool potato in a mixing bowl add beaten eggs, grated cheese, grilled bacon and half of the caramelized onion, mix together then make mash cakes. These should be soft but textured. 6. Place the cakes on a tray, hollow out the middle and bake for 20-25 minutes. 7. Heat oil in pan and fry off the garlic and 200g onion until soft then add the peas and bouillon, bring to boil and simmer, add the evaporated milk and blend to consistency. 8. Chop the tomatoes (reserve some for the garnish) and basil and simmer in a pan. Add the remaining caramelized onion and vinegar, then blend. 9. Pour the sauce in a dish then lay the potato cakes on top, pipe/spoon the pea mixture into the cakes. 10. Garnish with a fresh tomato slice. 11. Place in oven for 20-30 minutes.